A Federal High Court in Yola has ordered the remand of former Adamawa PDP Chairman, Alhaji Abdurrahman Bobboi, in prison for allegedly diverting food meant for Internally Displaced Persons (IDPs). Also remanded were Mr Sanda Lamurde, a former Commissioner for Finance, and Feredan George, a former Chief Store Officer of the State Emergency Management Agency (SEMA). Justice Bilkisu Aliyu gave the order on Wednesday, at the hearing of a case of alleged forgery and stealing brought against the trio by the Economic and Financial Crime Commission (EFCC). The accused are facing 16 charges bordering on forgery, theft and fraud. According to the EFCC Counsel, Mr Abubakar Aliyu, the suspects were arraigned following a petition received from members of Agricultural Transformation Agro-Allied Farmers Cooperative Union, Adamawa chapter. The union, in its petition to the EFCC, had alleged that the loan granted to Adamawa State farmers, from the Central Bank of Nigeria. were not disbursed to them. It claimed that the funds were diverted into the purchase of food for IDPs by the state government. Aliyu said that after investigation, the commission decided to arraign the suspects over the said transaction. He alleged that the accused persons took advantage of their membership of the State Committee on the Welfare of the IDPs, to perpetrate crime. According to him, Lamurde, who served under former governor Bala Ngillari, was the chairman of the committee while Bobboi, a former Chief Protocol Officer to the governor, was a member. 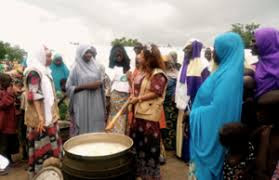 “The suspects conspired among themselves and diverted the funds amounting to N587 million released by the Adamawa State Government to buy food and other basic needs of IDPs,” he said. He said that the crime was committed between March and May, 2015. The judge, who adjourned the case to Nov. 10 for trial, ordered the accused persons to be remanded in prison custody pending the determination of their bail application.